Do you believe that Hanoi Old Quarter has a thousand year old? Yes, it’s actually is. Experiencing drastic changes and renovation, it become a landmark of our capital and attracts a lot of tourists, both Vietnamese and foreigners. Let’s see what makes attractions of the ancient streets. Mostly all Vietnamese know the well-known phrase “Hà Nội ba sáu phố phường”, meaning Hanoi – 36 old streets and guilds. It talks about the ancient area with unique features in our traditional capital. Back to about 10 centuries ago, artisans of professions from nearby villages around the capital gathered in an urban area of the citadel. Same products trading on the same road gradually made the street names in accordance to the professions or the products sold. That practice established a large urban area with flourished trading activities. There, a street’s name begins with a word Hàng (Commodity) and follows with a name of the goods sold on that street. In the old day, each street sold one type of traditional product. 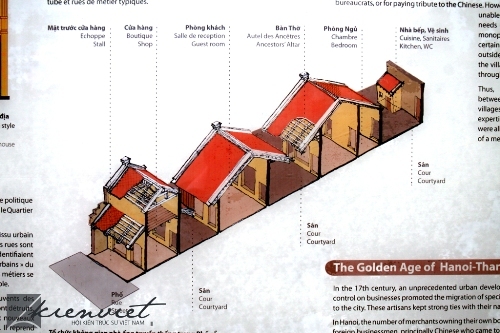 For instance, Hàng Bạc (Silver Street) sold silver jewelry; Hàng Mành (Curtain Street) sold bamboo curtains, etc. Hang Chao sells mechanical and electric products. The number of streets now in the quarter is not exactly 36. Perhaps, it is only symbolic number, which used to be true in the past when the urban area was small. 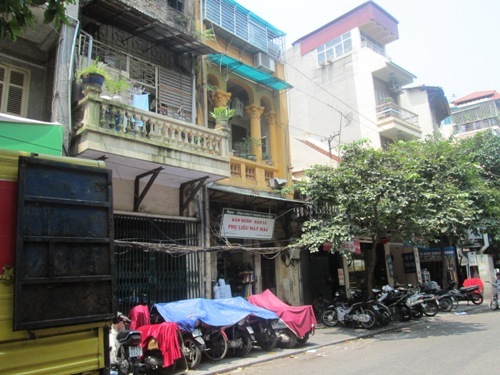 Now though we’re familiar with Hanoi 36 old streets and guilds, the area actually has 76 streets and covers about 100 hectares in Hoan Kiem district of Hanoi. Traditional architecture, with cascading tile of brick and wooden houses, lying in front of street. These usually are tubular houses with narrow width and long length. Though with relative small area, traditional houses still have separate spaces for different purposes: trading, making products, praying, living-room, bed room, etc. Hanoi Old Quarter is well depicted in paintings of a well-known artist: Bui Xuan Phai. The architecture style here is similar to that of Hoi An, which is well-preserved in Quang Nam province. In these days though, and less and less houses keep original architecture. The capital city has issued a special decree to restrict adverse changes, even prohibit new large commercial center and skyscrapers built in the area. Vietnamese street style: small crossing streets with “shoulder-pole retail”. Anything you want to buy is also available in rattan baskets hanging on bamboo pole. The image of a woman wearing conical hat with bamboo pole on shoulders strolling on street brings impression that you will want to take a picture. Great Vietnamese street foods served right in the 36-street area. Join in walking tour for sightseeing, and enjoy local foods right along street stands or in restaurants. Some must-eat foods include: bún chả, phở, trứng vịt lộn, bánh rán, bún ốc, bún đậu mắm tôm, etc. Besides, you’ll can also easily find stylish restaurants serving foreign food like French-style bread, Italian spaghetti and pizza, Japanese sushi, and Korean kimchi. Hanoi Old Quarter is also great place for shopping. You can buy local souvenirs like: silks, embroidery, lacquer ware, etc… which are typical products of Vietnam. To foreigners, especially Westerners, traffic in the maize quarter is pretty scary, or even crazy. You will see a non-stop flow of mixed transport means including scooters, bicycles, and cars. Just take a precaution, adjust your habit a little, and find out how to adapt to traffic here, you’ll see another interesting aspect that you can’t find elsewhere. Hanoi reserve several walking streets to service tourists. 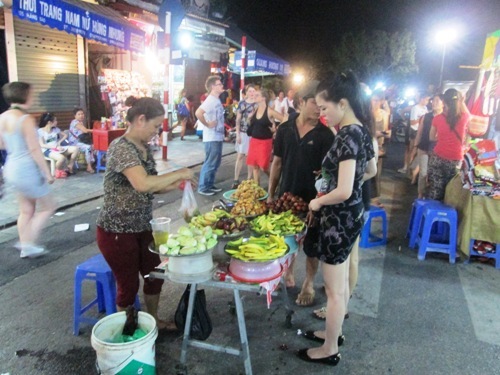 You can also visit Hanoi night market in the area of Old Quarter. The market open a weekend night: Friday, Saturday, and Sunday from 6pm to 11pm. You can take a walk yourself or join a walking tour from Hoan Kiem Lake to Hang Dao Street, all the way to Dong Xuan Market. It’s just crowded and regretfully fake goods are still all around. 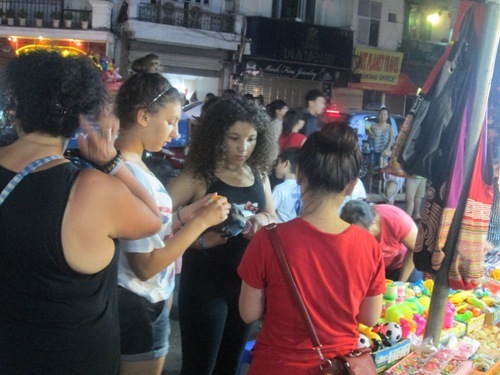 While you may find new experience while strolling on night market streets, just be careful of pickpockets, and traffic safety. Fort tourists, it’s good to go there for new experience in Hanoi Old Quarter at night, yet please don’t expect too much. Strolling through the old quarter or “36 streets” of Hanoi Old Quarter is one of a must-do that travelers should enjoy. You’ll see the beauty as well as typical characteristic of these streets, of our capital as well. If you have visited the Hanoi old quarter, you might want to share some of your thoughts here. How do you think about the landmark?